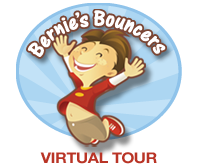 Bernie’s Bouncers is a Private Indoor Play Center for Birthday and Group Parties. ** above pricing does not include tax. We are not open to the public for general play! When you have a party with us, it's just your group...your friends and family. You don't have to worry about bigger kids getting too rough with the little ones! Bernie's Bouncers has recently added a Photo Booth for unforgettable photos during your next party! Our photo both is a kid magnet, they love to pose with their family and friends and your guests will get to keep a memory from your party. 20 postcard invitations which also serve as a permission slip. Your group will have 1 hour and 15 minutes to bounce and play in our large "Bouncer Room." Then you will proceed into your private party room for the remaining 45 minutes for food, cake, drinks, to open gifts, etc. All paper products ... plates, napkins, as well as plastic forks are provided. A case of 36 Juice Boxes are provided and there is also a drinking fountain in the hallway. Our two private party rooms include a refrigerator/freezer, sink with counter space and 4 tables with benches for seating. Fitted tablecloths are provided on the tables. We will have an attendant on staff at all times, but we are NOT a babysitting service. ** For More Detailed Party Information Please Click On The Above FAQ Tab. We take pride in our equipment and cleanliness. The bouncers, games & trains are wiped down with antibacterial cleaner & the party rooms are cleaned after each party. With time blocks avaiable 7 days a week you can have a party on your schedule. I have had 4 parties at Bernies Bounce House for my great grandchildren in the last 2 years and I couldn't be more pleased with the results. Not only do the kids have a blast but the adults seem to enjoy it as much as the kids do. The staff has always been very courteous and helpful and they make the experience a positive one. The facilities are always neat and clean. I wouldn't hesitate to recommend Bernies to any of my friends or co-workers. The Birthday Party we had at Bernie's Bouncers was fantastic! One thing I really liked was they provided postcard invitations that not only contained the party information but also clear directions to the location. I would highly recommend Bernie's Bouncers to anyone planning a child's party, the children will have a great time and the post party nap time will be a breeze! Had a party for my 6 year old this past weekend, was very pleased with Bernie's Bouncers. Facility was well run, very clean, kind staff and extremely organized! Open for private birthday and group parties only.